~It can help stabilize blood sugar. ~It’s a good source of magnesium, which reduces blood pressure. ~ It’s rich in B vitamins, particularly niacin, folate and B6, all beneficial to cardiovascular health. ~It’s full of antioxidants, including lignans, which protect against breast cancer. ~The powerful antioxidants and flavonoids in buckwheat prevent premature skin aging. Don’t skip breakfast. Take a few minutes to have this healthy, high fiber breakfast and you’ll have sustained energy and stable blood sugar, so you won’t be snacking on things you shouldn’t. 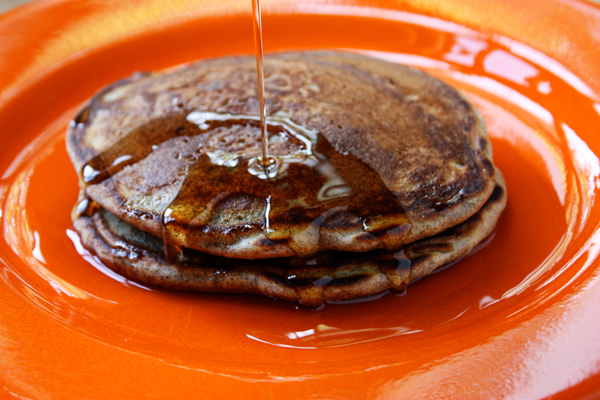 This is an easy pancake recipe, but then all pancakes are easy to make from scratch. I use a non-stick griddle, which doesn’t need greasing but I sometimes just rub it with a stick of butter. If you can’t find buckwheat flour at the grocery store, look for it at a health food store. You can also order it online. And it’s good to store it in a tightly sealed container in the fridge. 6 Comments on "Buckwheat Pancakes from Scratch"
I have to disagree that this recipe will lower blood sugar. The whole wheat is not good for stable blood sugar levels. Take that out and your correct. I didn’t look for your buckwheat pancake recipe, yet; ours is such a staple here, it’s hard to believe I’ll be switching from our no-set-recipe version, which is one of our daily uses for a little something from the sourdough pot. [at this point, I could probably put these together in my sleep -in fact, on occasion, I probably have- but it would be difficult to put the process on paper, or even virtual paper..] I just mostly wanted to say that you mentioned many great things about buckwheat -all true, all wondrous-, but I don’t see one of the biggies; namely, that, with millet, it is one of the few naturally-occuring sources of molybdenum, which, from what I’ve read, seems to be one of those elements that is useful, anode-cathode style, for collecting and ridding the body of other elements, that are considered, bad. Your recipes are wonderful, Jenny. Very Generous Work! Thank you. We just checked the site and the recipe is there, available through the recipes page as well as the blog. Can you please explain how you are looking for it so we can help? Thanks. There is no recipe? Just an endorsement.